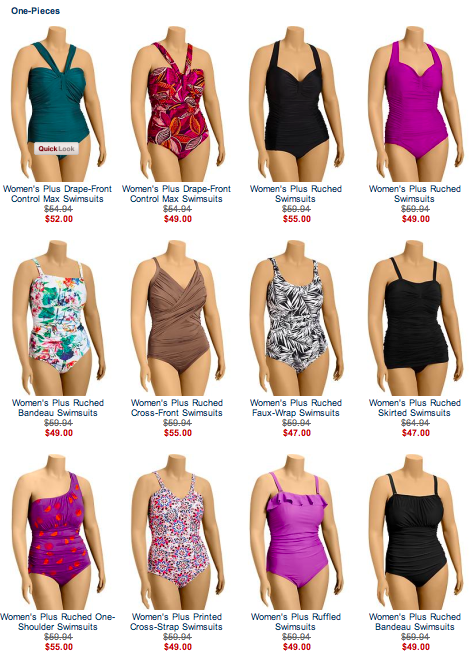 This entry was posted in How Does It Fit?, Plus Size Swimsuits and tagged affinity mingle plus sizes, Old Navy, plus size bathing suits, Size 4X Bathing suits by affatshionista. Bookmark the permalink. I will be by early for a lesson with Jenni, hopefully I will still be there for dinner. Thanks for following my blog, I really appreciate it. I’ve only ordered one suit from Old Navy, and it fit fine…except for the underwire bra part, which was far too big. Old Navy is fine about returns…I’ve always had very good experiences with their customer service. Their sizing can be wonky, but if anything, it tends toward too big rather than too small. For example, if you ever order their jeans, buy a size smaller than you wear at Lane Bryant, no matter what the reviews say. (My proportions are very, very similar to yours…I generally wear a 28 from LB, assuming they fit at all, but almost always need a 26 from Old Navy. However, their pencil skirts – the button & zip kind, like the denim – run smaller.) Good luck with the suit! Also, I’ve had ok luck with suits from Target. They may not say they’re the right size, but I have one in a 24 that fits and I ain’t no 24. Thanks for the detailed response. It makes me very happy to share this kind of information.